Doctor Who returns to screens with its annual holiday special, but Steven Moffat also uses it as an opportunity to set plot threads in motion for the show’s upcoming fiftieth anniversary series, in the process focusing less on the Yuletide setting than any previous special. With a long-forgotten foe returning, a new title sequence hearkening back to the face-including sequences of the Second through Seventh Doctor eras, and an updated TARDIS interior that also evokes some memories of past iterations, there are several hints already in place that 2013 is going to be a tremendously nostalgic time for the programme. Having previously appeared in the Patrick Troughton episodes ‘The Abominable Snowmen’ and ‘The Web of Fear,’ the Great Intelligence makes a welcome return as he shows off his formidable psychic power while trying to find a physical form. Richard E Grant adds a sinister air of gravitas to the role during his limited appearances, and it seems inevitable that greater things are in store for the Great Intelligence- though perhaps not with Grant as its host- going forward. Yet as intriguing as the villain is, it’s ultimately Jenna-Louise Coleman who is again going to be the major point of discussion. 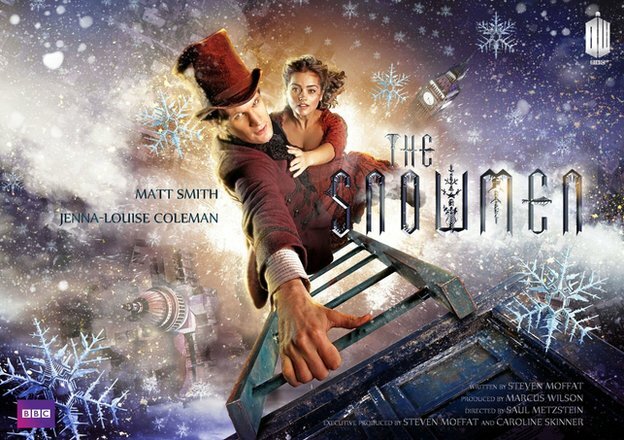 After apparently having her fate sealed as a Dalek during her genuinely surprising appearance in ‘Asylum of the Daleks,’ Moffat takes things one step further and overtly kills her in ‘The Snowmen.’ She’s fantastic in her dual role as governess as barmaid, and with the Doctor staying in the shadows more than usual as he copes with the loss of Amy and Rory, it’s Clara who makes a strong impression as she undertakes inquisitive task that the Doctor normally would. She also seems to have at least some knowledge of the Doctor, an intriguing concept. Yet for a woman who has not yet become the Doctor’s companion officially, there is a strong mystery surrounding her given her two apparent deaths already. The Doctor isn’t completely able to separate himself from events, though, and so the trio of Strax the Sontaran, Madame Vastra the Silurian, and Jenny the human make another appearance, both undertaking some investigations themselves and serving as a sort of dispatch service for the Doctor if anyone passes his test. This leads to some genuinely comedic moments, first with the memory worm and Strax and later with Matt Smith doing his best Sherlock Holmes impression. This certainly helps to lighten the tone of an otherwise quite sombre episode, carrying deftly by the sad and downtrodden nature of Matt Smith’s Doctor at this time. It’s not until the sense of a very strong mystery regarding Coleman’s Clara Oswin Oswald overtakes him at the end that his spirits start to lift. It’s certainly the relationship between Clara and the Doctor that is the most exciting aspect of this episode, especially knowing that she is going to become the companion despite her apparent demise(s). Accordingly, the actual story with the Snowmen and, eventually, the governess made of ice, don’t resonate quite as strongly as they otherwise might. Still, both the groundwork set here for the upcoming series as well as the return of the Great Intelligence are fantastic, and the physical presence of Richard E Grant paired with the vocal work of Ian McKellen is a very welcome and satisfying addition.